As the conflict in Syria enters its seventh year, nearly 12 million people have been displaced both within the country and beyond. Even in the face of ongoing brutal violence, many of these displaced Syrians long for their return home – dependent, of course, on certain conditions being met. Considering the importance of return and coexistence for the future of the country and the scale of the undertaking, it is clear that conversations about those conditions need to begin now, and must prioritize the voices of refugees themselves. The authors of the report, Rim El-Gantri and Karim El Mufti, spoke about their findings and the challenges they experienced during the consultations with ICTJ’s Marta Martinez. Marta Martinez: Most of the people you interviewed agreed that they would like to return home, but under certain conditions. What are those conditions? Karim El Mufti: The fact that the study was undertaken nearly seven years after the beginning of the war, it lowered the ceiling of demands. People interviewed agreed to one paramount condition: security and safety. If there is still war happening, if there are bombardments, if there is shelling, if there are kidnappings, if the area is not safe, then of course they would not return. Some say return depends on whether President Assad remains in power or not, but these were very marginalized opinions. Even the prosecution of criminals was not a clear condition for them to return. Instead, the conditions they named for a dignified return were very practical. They want safety and infrastructure, of course. They need roads, they need bridges, they need physical reconstruction. They need healthcare facilities and shops to visit. They need help de-mining their fields, to grow their crops again. They need education and schools. When the wheel of physical reconstruction starts turning, they want to be part of that. Without that, there is no way they can return because there is nothing to return to. Rim El Gantri: Many people also said that psychosocial support was very important as a condition of their return, especially those who have lost loved ones. People, including children, are enduring enormous trauma from what happened to them while fleeing. Others added that family reunification was also a condition because there was a fragmentation of the Syrian family. Some relatives are in Lebanon, while brothers are scattered throughout Europe, and parents remain in Syria. So there is a diffusion of the Syrian family, and people would like to reunify. Karim: Syrian youth have one primary concern: they do not want to belong to a sacrificed generation. They do not want to fall through the gaps in education and opportunity. They do not want to be drawn into this black hole of uncertainty. They want a future for themselves and they are willing to work hard for it. And they are: youth we sat with in various parts of Lebanon, whether low income or middle income, middle classes youth, are very engaged in civil society. 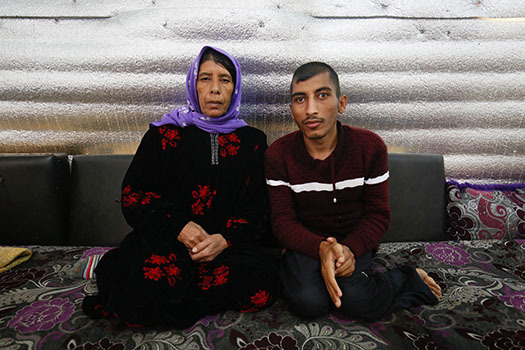 Although they want to resettle in the third country, they are very eager to come back to Syria because they feel they have a future there – if their conditions of return are met. They want to be a part of the reconstruction process, they want to be part of the reconciliation process, they want to grow into responsible citizens. When the wheel of physical reconstruction starts turning, they want to be part of that. Marta: Why talk about reconciliation in Syria when violence and impunity show no sign of relenting? Karim: The discussion needs to start at some point. It is a very delicate and complex question: can you achieve reconciliation despite massive breaches of human rights and international crimes of inhuman proportions? History says yes, but every time it is different. I mean, look at France and Germany, the European Union, look at peace agreements between Egypt and Israel, between Jordan and Israel. So what are the keys for the Syrian context? Nobody knows. With an equation this long and with this many variables, it is a very hard question. But there remains hope of a settlement so that people can resume their lives, return home and seek justice. I think it is the role of academics and international organizations and structures that pursue justice to at least point in that direction, even though maybe today it is not realistic. Rim: Yes, it is quite early and quite difficult to speak about reconciliation. But our research is meant to develop a better understanding of the priorities and expectations that Syrians have regarding their vision of a potential return. We want to know the role they see themselves and their communities playing in overcoming the divisions and promoting justice and reconciliation. Rather than impose a process on the refugees, we seek to raise their voices. Rather than impose a process on the refugees, we seek to raise their voices. Marta: Even the term reconciliation can be seen as problematic in many ways. In your interviews with Syrian refugees, you decided not to use the word reconciliation, but the word coexistence. Could you talk about that decision and the tension between those two notions? Karim: Reconciliation is a very charged word. It is a very charged concept. It basically translates into the “loser” agreeing to the terms of the “winner”. And this is not the way we wanted the work to be understood by the respondents. Instead, we used a word that would have been in the study anyway because it is key to social repair: coexistence. It is a concept essential to the way of life in the Levant, where many different communities coexist. Rim: Rim: Coexistence implies a measure of reconciliation. You cannot coexist without a minimum of reconciliation. And while we used the term coexistence, we left respondents the freedom to use whatever other words they chose – including reconciliation. And some of them did. Karim: Some optimists would use the word for reconciliation in Arabic, musalaha, to say such a thing possible, we can do it. Others would also use the word to say how much of a scam it would be – they would reference the Ministry of Reconciliation that was set up by the Assad regime, and say that authorities offered amnesty in exchange for surrender and called it reconciliation. The regime and the authorities have charged the word, so it was very important for us, as researchers engaging with refugees from different social and political backgrounds, to make sure they understood that this study would not be taking sides. We wanted to hear their stories, their perception, their vision, and not force them into any kind of uncomfortable path. Rim: Using coexistence also pushed participants to consider their past. Were they really coexisting together before the war, or were they obliged to live together under the dictatorship? Many of them said that there was never coexistence in Syria, but that the regime simply did not allow them to speak about religious or political differences. Marta: Karama, dignity in Arabic, was also a central concept throughout your interviews. Can you tell us more about the importance attached to it by those you interviewed and how you think it can be restored? Syrian refugees, almost down the line, all mention dignity in relation to the humiliation in which they believe they now live. They fled their country to live in Lebanon and are now enduring racism and discrimination every day. Refugees are accused of crimes, or are blamed for unemployment or even just the general problems facing Lebanon. So they feel humiliated everywhere they go. They do not feel like full citizens. They feel undignified. This feeling itself has become a kind of catalyst for return. Some say: if I could return to my country, I would prefer to die there than live in humiliation in another. Karim: War is undignified. It destroys societies, it destroys families, it kills people, it dismembers communities, and everything that dignified you just collapses. Your dignity is related to a specific community and when your community is targeted, your dignity is lost. When you are tortured, arrested, humiliated, and persecuted, you are stripped of your dignity. If you are a patriotic Syrian, your country is also destroyed and has lost its place in the world and the international community. That is also a loss of dignity. These feelings are compounded among the displaced. You lose everything overnight and you run for shelter in a country that does not welcome you, where you have no ability to move freely, where you are trapped, where you suffocate, where policies are completely inadequate to your situation. You cannot go back home. You cannot go anywhere. You do not have a right to work and yet you have bills to pay. Things are very harsh on them and yet they cope. They are very resilient. Some say: if I could return to my country, I would prefer to die there than live in humiliation in another. Marta: Despite all the very negative impacts of displacement, there seems to be a small silver lining: for instance, Syrian women have carved out new roles in Lebanon. Could you talk about how that happened? Karim: In Syria women lived under a patriarchal society, a very conservative society. There is a very high rate of illiteracy among women in Syria, and only 22-23% of the workforce is comprised of women. Women were traditionally housewives, and wielded very little power. But because of forced displacement, men are experiencing a sort of emasculation. Men are more likely than women to be suspected of being terrorists deserters, or are more likely to be arrested at checkpoints. They face discrimination, they are not being paid, they cannot provide for their families and they cannot move freely because of checkpoints. Rim: The fact that men risk being arrested by Lebanese authorities while trying to bring bread back to their house forces women to go out and provide for the family. This gives them a new strength, a new position, a new role to play. It also pushes them to participate in activities with civil society organizations and international organizations, which empowers them and teaches them new skills. These skills could allow them to create their own businesses, hold their own jobs, and many of them even have small amounts of money in order to build and to establish their own projects. The catalyst of all of this is quite negative, but at least this result was positive. All of those whom we interviewed wanted their opinions to influence policy makers, because they feel that policies are implemented without their consultation, that things are coming from the top down. Karim: Because of the family dismemberment, there is also less patriarchal control over women’s lives. Women can now go to school, to university when they can afford it. They can work. They are activists, part of newly vibrant civil society organizations where they are engaging in workshops and trainings on coexistence, on peacebuilding, on conflict resolution, on religious dialogue. These are skills they want to take back home with them, where hopefully, this gender empowerment will not die away and will have some significant impact on tomorrow’s Syria. Marta: One last question: what are the most pressing recommendations that the report offers? Rim: We want to integrate the views of the refugees into policy discussions about conditions for return. All of those whom we interviewed wanted their opinions to influence policy makers, because they feel that policies are implemented without their consultation, that things are coming from the top down. Karim: The reconstruction and the reconciliation of Syria must also be in line with the cultural patterns and the cultural specificity of Syrians. Local reconciliation processes need to be legitimized in order to be secure long-term. Otherwise, instability will become a pattern for generations of Syrians. Rim: In terms of return, we have talked a lot about land restitution and property, and the fact that many refugees told us that they would only return to their native region. If they return, someone from Homs would not go back to Aleppo because they fear being regrouped according to a sectarian vision. You cannot live in a place while you know that someone else is colonizing – and that is the word they used, “colonizing” – your house, your shop, or your land. So it is something that really needs to be discussed more. We also could not ignore the fact that gender-based violence, women’s exploitation, and child marriage were mentioned by a number of respondents, and we recommend those issues be explored further.